American Chopper fans were surely shocked as the latest season kicked off with the apparent firing of Paul Teutel Jr., but that's not the only surprise in store for the long-running reality television series this year. It seems the Teutuls have more on their cycling minds than just screaming matches and outlandish Harley-inspired customs. In fact, Paul Sr.'s next two-wheeled venture is just about as far in the other direction as you could imagine. Curious? Think Italian, and think fast. That's right, though it seems at first glance like a rather odd pairing, Teutul Sr. (right) is indeed opening a Ducati dealership in his home state of New York called Ducati Hudson Valley. To celebrate OCC's 10th anniversary, the shop has turned its torches away from rumbling American V-twins for a moment and focused its attention on a new custom L-twin-powered Monster 1100 that will be featured on an upcoming episode of American Chopper on TLC. Still don't believe it? No worries – we did a double-take too. Click past the break for the official press release. Cupertino, Calif. (22 April 2009) – Ducati North America announced today that the leaders of cutting-edge custom choppers, the famed Orange County Choppers and stars of TLC's "American Chopper", will debut a single-branded Ducati dealership, officially called 'Ducati Hudson Valley' at its Newburgh, New York location. Marking 10 successful years in the custom-chopper business, OCC's Paul Teutul Sr. felt the need to expand the dealership to include more of what is hot in the two-wheeled marketplace by incorporating Ducati's motorcycles, apparel and destination dealership-feel. As part of the anniversary celebration, OCC will debut a highly anticipated custom Monster 1100 to coincide with the dealership launch activities. The bike will not be a chopper but will definitely appeal to their audience. Motorcycle fans can see the full Monster 1100 unveil later this season on an episode of TLC's "American Chopper" (Thursday, 9 PM ET/PT). "Ducati Hudson Valley will no doubt prove to be a stepping stone in boosting sales and reinforcing Ducati's presence in the Northeast," said Michael Lock, CEO Ducati North America. "Ducati is known for innovative brand tie-ins and we are challenging dogma by exploring creative partnerships like this one with Orange County Choppers. We really looking forward to seeing what they do with the Monster 1100." Ducati Hudson Valley's showroom will be the very first of Ducati's Retail Design Projects to highlight new elements from Ducati's visual corporate identity, which include custom-made 'bike stands' incorporating graphics tailored to specific motorcycles such as an 848 on a race track or riding a Monster 1100 through curvy mountain roads. Also new to Ducati Hudson Valley is a service area that will feature Ducati's signature red-and-white paint scheme inspired by Ducati's MotoGP replica bike, the Desmosedici. "We prefer to partner with brands that are class leaders so naturally when we were looking to expand beyond choppers, we saw Ducati as a perfect fit," said Paul Teutul Sr. "Ducati's global reputation in the Superbike world along with the brand's style and design elements really make this an unique opportunity for us." Founded in 1926, Ducati builds racing-inspired motorcycles characterized by unique engine features, innovative design, advanced engineering and overall technical excellence. The Company produces motorcycles in five market segments which vary in their technical and design features and intended customers: Superbike, Hypermotard, Streetfighter, Monster, Sportclassic, and Multistrada. The Company's motorcycles are sold in more than 60 countries worldwide, with a primary focus in the Western European, Japan and North American markets. Ducati has won fifteen World Superbike titles and more individual victories than the competition put together. For more information about the Company, please visit our web site at www.ducati.com. Paul Teutul, Sr., metalworker by trade, first began his business of building custom choppers out of the basement of his home in Montgomery, NY. With the creative help of his oldest son Paul Jr., the two were soon on their way to the top with the success of their first bike, "True Blue" which debuted at Daytona Biketoberfest in 1999. 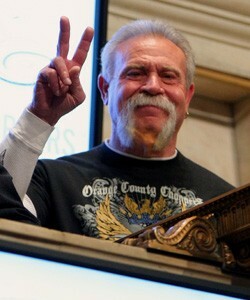 From that point on, Paul Sr. knew he had something and established Orange County Choppers that same year. Headquartered in Newburgh, NY, Orange County Choppers is regarded as one of the world's premier builders of custom and production motorcycles. The OCC Brand has become one of the most recognizable brands in the world and has also produced a wide array of merchandise such as t-shirts, hats, die casts, assorted novelty items, guitar accessories and more. The OCC shop is featured on American Chopper, a reality television series that chronicles the lives of the OCC crew as they battle impossible deadlines to create outrageous custom chopper creations. The show, which has contributed to the company's quick rise to fame, debuted in September 2002 on the Discovery Channel and in 2007, Discovery Channel's sister station, TLC, took over the broadcasting and it now airs on Thursday nights at 9pm ET/PT. For more information, visitwww.orangecountychoppers.com and www.occmotorcycles.com.